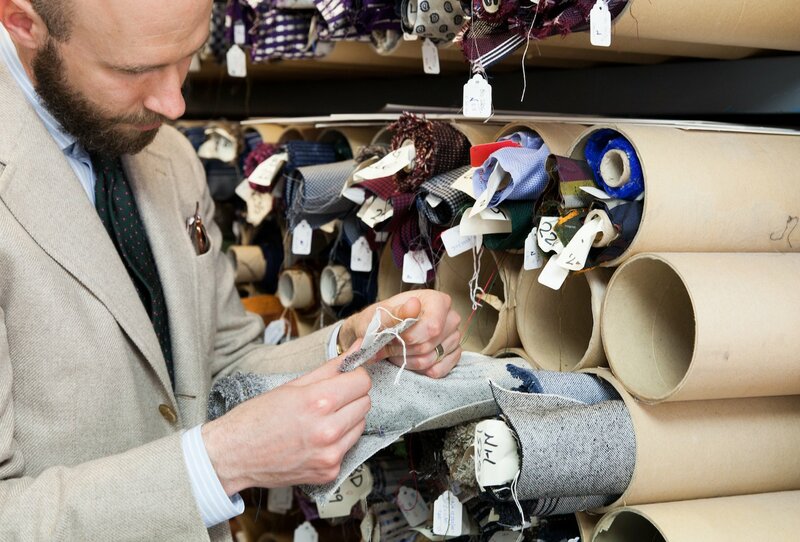 A few week ago, Drake's asked me to try out their made-to-order tie service, which has been given a new digital home on the website. The prime question is, of course, do you really need a MTO tie? It didn't even feature on my list last year of the things that were worth making bespoke. There will always be particularly tall guys and short guys that can justify this more easily. Although the Italians have made a very long rear blade rather fashionable, most guys want their two blades roughly the same length (with the front blade ending around the trouser waistband). Beyond men of unusual heights, then, there is little but pickiness to justify a MTO tie. But readers of this site surely thrive on some level of pickiness. It's just a question of how far they want to take it. For myself, I have always liked 9cm-wide ties. (I may even be able to claim it's not fashion-driven, after 15 years of buying them.) I like lightweight linings (makes a tie a touch less stiff and formal - something it sorely needs). And I hate having keepers on the back of my ties, because I never use them. The Drake's service allows me to specify all these things, which is satisfying. The range of materials is not huge, but it is growing and includes many of the classics. I picked a printed silk in a slightly different olive colour to the two I already have. (Am I honing my style or becoming boring?). You can see the full interview on the Drake's site here. Also, in response to a question last week from a reader: The MTO service is not available through the Haberdasher Street factory store, but is at the Clifford Street shop. And the latter normally gets cloths before the website - so there are some shantungs and other silks only available at Clifford Street at the moment, which will go online shortly. Great in pale blue. 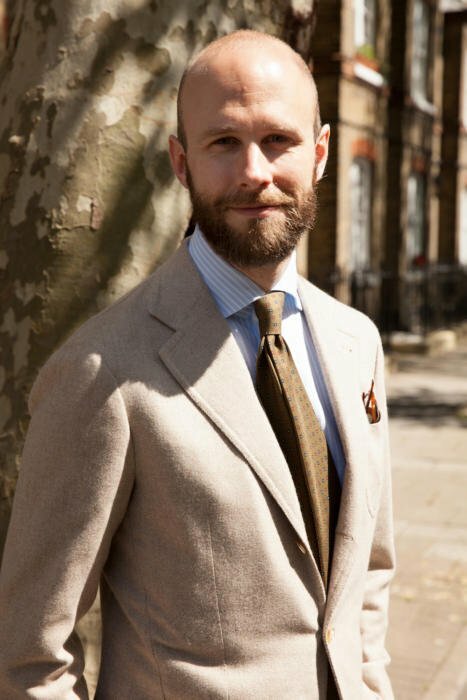 The stripes are wide and pale enough such that any tie pattern can happily sit on top of them. Repeating tie motifs start to clash when the stripes become stronger and denser - a dark-blue bengal stripe, for example. And are OK again when they get down to a hairline stripe. I was originally wearing (in the image above) a forest-green woven Drake's tie. You can follow the discussion on Drakes made-to-order ties by entering your email address in the box below. You will then receive an email every time a new comment is added. These will also contain a link to a page where you can stop the alerts, and remove all of your related data from the site. I’m just waiting for my ‘bespoke’ tie from Shibumi to arrive. Which was the same price as their normal ties. I also prefer a 9cm blade but a slightly longer tie (154cm) so no doubt Drakes MTO service will get my custom soon. Do Drakes offer an embroidered service with their ties? Are you tall enough to be able to justify a MTO tie for extra length? Being an average height man who doesn’t wear low-rise suit trousers or tie windsor knots, ties are just about always too long for me. I switched to a double-four-in-hand tie to help a little, but it’s still not usually enough. Franco Bassi of Como offer a MTM tie service via their website. As well as choosing the width and length, the designs have a spcial rectangle woven into cloth on the narrow end in which the initials are hand embroidered. Part of the order process requires choosing embroidery and tipping colours. This tiemaker also offers bespoke ties with embroidery, of practically anything that it is possible to embroider on a tie; fox heads, flags, logo, and, really cool, your actual signature as the embroidery. Hello Simon, could you please share details of the shirt fabric if you have them? Beautiful, and good suggestion re patterns. Many thanks! Sure, let me get the book and number. Great post. Simon (or others on the site) do you know if that fabric available from the ready made section of the website? Can’t see your A&S trousers in these photos, Simon. Are they bespoke or from the shop on Clifford St, may I ask? Called in there on Saturday – lovely stuff and very friendly staff. Came out seriously thinking of investing in a couple of pairs of their flannel trousers at least so am interested in your opinion. I’ve just measured my favourite tie and the length is 146cm. And I’m 6’4″! I think it must be because my trousers are all cut for braces and high rise. Anyway, have gone for an ancient madder, and 9cm for me too. 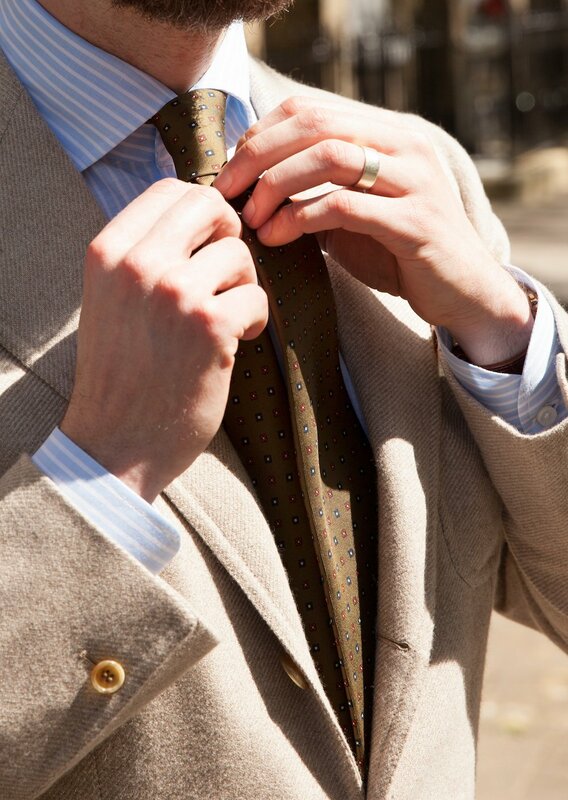 The tie – as can be seen – it is an object to be tailored, each part can have a choice. Interesting to know Drake’s now offers this service. While I agree that having a bespoke tie may be only for the picky, I don’t think it’s going much further at all when a man’s suit and shoes are made bespoke. I really enjoy Sam Hober and it’s difficult for me to think of ever buying another tie that didn’t have all the details I enjoy. Plus, the cost is only slightly more (at least for Sam Hober’s rates) with all the freedom and advantages of personal preference. MTO allows you to specify the length of the tie and you mentioned you prefer both blades of the tie to be equal length upon tying. How does one know exactly how much ‘extra length’ is needed to achieve this? Hi Simon, two questions. Firstly, do you think that many men will go down the MTO route, especially when at least from personal experience, I have maybe 40 ties or more, but tend to wear the same 4-5. It seems like a lot to spend on a tie! Also do Drakes make ties for private labels? Yes, Drakes historically made entirely for private labels and a small part of the business still does so. I think the MTO route is really for those who want that perfect tie – to be one of those 4 or 5 – in the same way I always want a 9 inch grenadine but few places do them anymore. Is it possible to get 9cm plain grenadine’s RTW?